The seminar confirmed the Greek research community’s interest and particularly that of young researchers in Open Science/Open Access, as well as its willingness to adopt Open Access in research activities. 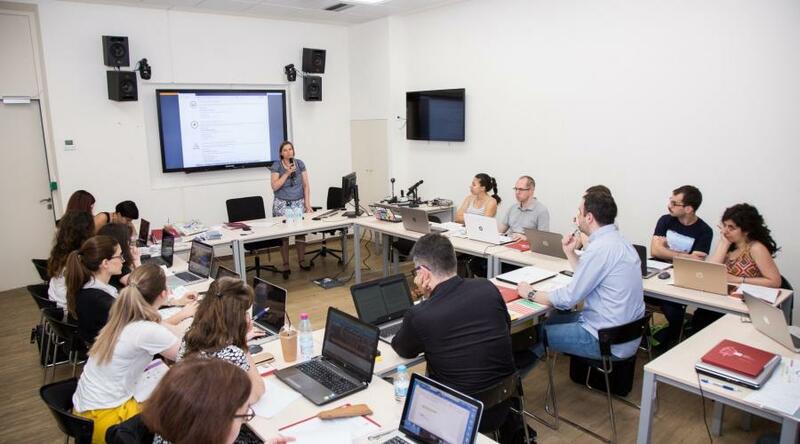 Open Science and the Management of Research Data was the topic of the seminar organised by the National Documentation Centre (EKT), as National Open Access Desk (NOAD) for the OpenAIRE Open Access project (OpenAIRE NOAD), in co-operation with the European project FOSTER, on Tuesday 5 June 2018, for early career researchers in the Social Sciences and Humanities (SSH). The seminar confirmed the Greek research community’s interest and particularly that of early career researchers in Open Science/Open Access, as well as its willingness to adopt Open Access in research activities. It also highlighted the importance of organising similar events which inform, create awareness and offer training. In this context, the interest of participants to communicate with authorities and institution libraries with a view to organising respective activities can be seen as a positive step in the promotion of Open Science. The introduction to the first part of the seminar covered the concepts of Open Access, Open Science and research data. In addition, Nancy Pontika (FOSTER) presented the obligations of researchers under horizon 2020 to provide open access to publications and data, as well as the importance of using the database FAIR (Findable, Accessible, Interoperable, Re-usable data). Emphasis was also placed on licences, particularly Creative Commons and its various forms. The presentation ended with the potential benefits of Open Science/ Open Access for researchers. Iryna Kuchma (FOSTER) reviewed actions and available material which FOSTER has developed to support and train/educate the researcher in applying Open Science. She focused not only on issues such as data protection, ethics and anonymisation, but also the tools capable of dealing with them. The first session was brought to a close by Ellie Papadopoulou (OpenAIRE), who paid special attention to the national nodes network and ways to support the research community through a variety of activities and services offered. The second half of the seminar was more interactive as participants were able to present their practices in providing Open Access to publications and their data and pose questions arising from this process. The different types of data managed by participants led to a really fruitful discussion and exchange of experiences and ideas. At the same time, it highlighted the need for long-term preservation of data following the completion of the project generating that data. During the final session, participants had the chance to learn about funding opportunities for the SSH disciplines under Horizon 2020, and networking with other researchers. Henry Scott (National Contact Point, horizon 2020) presented the funding opportunities for ‘Societal Challenge 6: Europe in a changing world-inclusive, innovative and reflective societies’, ‘Science with and for society’, Marie Sklodowska Curie actions and the opportunities the European Research Council (ERC) offer. Dimitris Maragkos (EKT) presented the ‘Knowledge and Partnership Bridges’ initiative which is based on three pillars: networking and subsequent successful co-operation through the creation of a global network of Greek scientists, professionals and entrepreneurs, notification of funding opportunities in Greece and the mapping of Greeks living abroad.